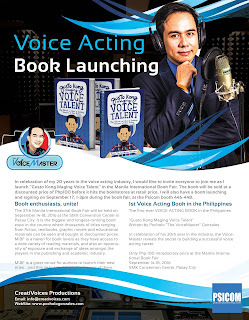 In the book fair, I will be releasing my second book entitled “Gusto Kong Maging Voice Talent.” I am thrilled and honored to have written the country’s first-ever voice acting book, the way I have built the country’s first-ever voice acting school in 2005, the Philippine Center for Voice Acting. The Youth for Environment in School Organization (YES-O) in coordination with the Manila Youth Leaders for the Environment (MYLE) of the Division of Manila conducted its Annual Leadership Training last September 9 at the Araullo High School in Ermita, Manila. The theme of this year’s training is “Empowering the Youth Towards Environmental Stewardship.” The training featured speakers who are advocates not only of the environment, but also of youth empowerment, such as Filipino motivational speaker Pocholo "The VoiceMaster" Gonzales. In the afternoon session, the second presentation was done by Arlene Padua-Martinez, another mentor from Go Negosyo. She did a session about marketing one’s business especially in the age of internet and social media. Her presentation was followed by an inspirational forum where successful local MSME’s were asked to share their success stories to the audience. The forum was moderated by Mr. Butch Castro of DTI Albay. The seminar ended with some closing remarks by DTI Albay's Provincial Director, Mr. Rodrigo M. Aguilar. On August 20, the Philippine Junior Marketing Association (PJMA) conducted the first installment of Juan Big Idea, its annual marketing convention which serves as the organization’s platform to reach marketing students all over the country. With this year’s theme “Ang Paglipad ng Marketistang Pilipino,” the Luzon edition was held at the F.L. Dy Coliseum in Cauayan, Isabela, and was attended by over 1,000 students from all over the region. The event featured talks centered around the theme of marketing, including Filipino motivational speaker Pocholo “The VoiceMaster” Gonzales. Pocholo’s talk was about “Marketing for the Global Citizen,” where he shared his journey about starting as a freelance voice artist to becoming the most recognized Filipino voice artist even in the international scene. He talked about his childhood dream of hearing his voice on the radio greeting his mother, and how it led to his vision of making the Philippines the center of voiceover excellence in Asia. Pocholo also talked about his company and his voice acting school, and even amazed the audience with an ensemble of voice characters. Pocholo then transitioned his talk on marketing, and how one can establish his/her brand to compete on a global scale. He touched on a bit about global brands such as Google, Facebook and even 7-11, and how these brands have gained top-of-mind awareness despite not having extensive ad campaigns. Pocholo said that being a global brand – be it a person or a company – all boils down to the experience that they provide, in order to give people something to talk about. Pocholo’s talk did not only focus on the technical aspect of marketing. He also inspired the students by challenging them to discover their purpose, and to do things with passion and commitment. He shared to them how his success as the VoiceMaster was not purely about what he has done with his skill, but more importantly his passion and zeal to make the Philippines the center of voiceover excellence in Asia. He also shared the qualities that make a successful entrepreneur and marketer. The Philippine Junior Marketing Association (PJMA) is the official youth affiliate of the Philippine Marketing Association (PMA) and is the national alliance amongst the local Junior Marketing Association (JMA) organizations from different colleges and universities across the country. On August 17, 2017, the Young Entrepreneurs Society Philippines or YES Philippines, in partnership with EntrepRadio and Pen Brothers, organized a seminar entitled “Passion-Driven Enterprises”. This 3-hour seminar was aimed towards a mindset shift from going into business being motivated by money to going into business being motivated by passion and purpose. The seminar featured none other than Filipino motivational speaker Pocholo "The VoiceMaster" Gonzales – the most recognized Filipino voice artist, veteran radio broadcaster, internationally-awarded youth advocate, author, and a highly sought-after voice director, trainer and motivational speaker. Pocholo is also a Go Negosyo awardee and Angelpreneur, and the founder of Youth Entrepreneurship Academy of the Philippines (YEAP). The seminar opened with EntrepRadio’s main anchor and YEAP Executive Director Dennis Sajo, who introduced their advocacy in igniting the entrepreneurial spirit of the youth. He also shared his own experience on how his own passion for speaking and motivating people has led him to cross paths with the VoiceMaster, and how he grabbed the opportunity to host the show and head YEAP when the opportunity was opened to him. Dennis then introduced and called on the VoiceMaster onstage, whom he referred to as his mentor and brother. Pocholo started his talk by energizing the crowd and getting acquainted with them. He shared the story of his entrepreneurial journey, from the time he started working as a freelance voice artist until he opened his first recording studio, Univoicesal Productions. He told the participants how his first business venture failed, costing him 2 million pesos worth of investment after 6 months. Learning from his mistakes, he attempted to start a smaller recording studio in 2005, which is now what is known as Creativoices Productions. After entertaining and mesmerizing the audience with his voice acting talent by doing a repertoire of character voices, Pocholo then shared that PASSION and PURPOSE are the 2 key ingredients not only in building a successful business, but also in being able to persist amidst trials and challenges. “Just do what you love and the money will follow,” was the wise advice of the VoiceMaster. He also said that knowing why you are doing your business in the first place guides the entrepreneur as he builds and grows his enterprise. Pocholo then led the group through a quick workshop on how they can identify their passion that can be turned into a business. He asked them to list 5 things that they are interested in, then choose 3 that they feel they are passionate about. He defined passion as something that someone would be willing to do everyday even if they are not getting paid to do it. He then shared different methods on how those passions can be made into a business – creating a product or service, creating a digital product or even teaching the skill to other people. The seminar ended with Pocholo inviting the participants to volunteer and become part of EntrepRadio and YEAP, which he founded for young aspiring entrepreneurs. EntrepRadio is a weekly radio program for young entrepreneurs, airing every Sunday from 9 to 10am, at DZRJ 810AM, with live streaming at 8 Trimedia Facebook and Youtube channel. Youth Entrepreneurship Academy of the Philippines is a training and mentoring program for young aspiring entrepreneurs, created to support Senator Bam Aquino’s Youth Entrepreneurship Act or R.A. 10679. On August 12, 2017, Voice of the Youth Network (VOTY) celebrated International Youth Day with Kabataan Night 2017. The event was held at the D’Cup Coffee Republic in Mandaluyong City. The event was organized by VOTY under the supervision of its founder, Filipino motivational speaker Pocholo "The VoiceMaster" Gonzales. The event was divided into two main segments. In the afternoon was Youthalks, a series of empowerment talks and forum. Three speakers took the stage to inspire the young participants – Dr. Edwin Monares of SAVE ME Movement, Dr. Rey Samson of Pamantasan ng Lungsod ng Muntinlupa and an anchor of Voice of the Teachers, and Coach Adette Purto, co-founder of D’Cup Coffee Republic. The talks were followed by a series of youth forums, each discussing a specific topic. Each forum was facilitated by anchors of some of the radio shows produced by the VoiceMaster. The School of Life forum was hosted by anchors Bernz Caasi and Vic Asuncion, with panelists John Leo Algo and John Leonard Chan. It was followed by the Call Center Radio forum with JM Jasmin and MA Buendia, hosts of the radio show. Up next was The Author’s Voice forum, hosted by the anchors Sha Nacino and Bryson Bonsol, with Steffi Villa as their guest. The last forum was the EntrepRadio forum, hosted by main anchor Dennis Sajo, with guest panelist Jason Domantay. Evening came, and Youthalks was followed by the Kabataan Night proper, which featured a series of performances, games and an open mic. Several groups and solo performers from Artist League Manila entertained the crowd, followed by more musical performances and spoken-word poetry from artists featured in VOTY’s radio programs. The night was also filled with inspiration and empowerment as youth advocate and Filipino motivational speaker Al Ian Barcelona gave a short but powerful speech. Kabataan Night 2017 was capped off with the closing remarks from Pambansang Inspirasyon Lloyd Luna, who inspired the young audience to go after what they are passionate about. He then called on the VoiceMaster and presented the “Present-Day Rizal Award” in recognition of Pocholo’s dedication to serving the Filipino youth. On August 10, 2017, over 100 micro, small and medium entrepreneurs (MSME’s) attended the free Negosyo Seminar under the Mentor Me Program, a joint project of the Department of Trade and Industry (DTI) and Philippine Center for Entrepreneurship, more popularly known as Go Negosyo. The seminar was held at the Marinduque State College in Boac, Marinduque, and was part of the first phase of the program, which focused on developing good business sense among MSME’s. Filipino motivational speaker Pocholo “The VoiceMaster” Gonzales was invited as a resource speaker on Entrepreneurial Mindset and Values Formation. After the introduction and welcome remarks, Pocholo came onstage and energized the crowd. He shared his own entrepreneurial journey on how he built his voiceover studio and voice acting school, armed with nothing but a 10,000-peso capital and his passion for his craft. He also shared his vision of making the Philippines the center of voiceover excellence in Asia, and how he is gradually making that vision a reality by establishing a school to produce quality and passionate voice artists. Pocholo’s story was also backed by his talent, as he amazed the audience with his repertoire of character voices. His story as an entrepreneur was a great transition to the topic about entrepreneurial mindset. Pocholo started on this topic by redefining what it means to be a successful entrepreneur. He challenged the idea that building a business is all about making profit, and encouraged the participants to build their business with passion and purpose. He also touched on the crucial values of an entrepreneur – setting goals and plans, creating success habits, and developing an eye for opportunity. In line with having the right mindset for getting into business, Pocholo also talked about the three-pronged approach to deciding on a business. According to him, an entrepreneur should build a business that 1) he is passionate about, 2) solves a problem, and 3) live longer than you (the value of legacy). Pocholo’s talk was followed by a training on Marketing, by fellow Go Negosyo Angelpreneur and motivational speaker Henry Tenedero. Go Negosyo was also represented by Senior Programs Development Officer Jeah La Guardia. Mentor Me Program is an initiative under DTI and Go Negosyo's Kapatid, Angat Lahat program that aims to help MSME’s scale up their business through weekly coaching and mentoring on the different functional areas of entrepreneurship. On July 22, about a hundred participants filled the D’Cup Coffee Republic in Mandaluyong City to attend the event “Ignite Your Dreams.” This whole-day event was organized by Pinoy Save and Invest, and featured business and finance coaches to teach the participants how to start their path towards financial freedom. The event also gave them an inspirational boost from Filipino motivational speaker Pocholo “The VoiceMaster” Gonzales. The first speaker of the event was Allan Mantaring, founder of Pinoy Save and Invest. He shared his humble beginnings as a young man who started with nothing but his dream to become successful. His perseverance and determination to succeed fuelled him to become the author, speaker and infopreneur that he is today. Allan was followed by fellow coaches who also shared their experience and expertise in the topic of business and finance – lifestyle coach RD Cedro, financial coach Jet Semilla and business coach Elmar Nabisa. While each have their own businesses, they all inspired the audience with the shared message of believing in the power of their dreams. The last speaker for the day was Filipino motivational speaker Pocholo “The VoiceMaster” Gonzales. In a short talk, Pocholo also shared his own journey towards building a business around what he calls the most powerful human instrument – the VOICE. He told the story of how his simple dream of hearing his voice on the radio greeting his nanay on air turned into something bigger than what he could have ever hoped for himself, which is to become the country’s most recognized Filipino voice artist. Pocholo livened up the crowd by giving a sample of the several character voices he can make. In the end, he shifted the mind of the participants from being motivated to get into business for the purpose of making money, to getting into business to find meaning and purpose in life. Pinoy Save and Invest is an online platform that is dedicated to inspiring and empowering Filipinos all over the world on the importance of saving, investing and even retiring with good finances. On June 29, TAG Media and Public Relations organized a workshop on blogging, branding, SEO and public speaking, held at the Misono Teppanyaki restaurant in Makati City. Around 50 participants attended the event to learn about the topics from the industry experts, including TAG Media founder, Engr. Grace Bondad-Nicolas, and Filipino motivational speaker Pocholo “The VoiceMaster” Gonzales. The event started with a networking activity, where the participants were given time to go around and chat with each other. As some participants have come from provinces near and far, the networking was a good opportunity to establish potential partnerships and future deals. After the networking activity, Engr. Grace was the first speaker in the four-hour event, where she talked about the importance of blogging and the use of social media in PR. She shared her own experience as a marketing and blogging expert, and also shared tips on how to write a good press release in as little as 5 minutes! She gave the participants a few minutes to write their own article, using the technique and structure she has shared. The next speaker was Robert Rillorta of Tree Top Adventure Baguio. Robert talked about search engine optimization. He explained the benefits of SEO to any business, and how they can leverage the power of social media to engage with their audience. He also touched on some of the metrics that gauge the effectiveness of one’s SEO efforts. Robert was followed by Jackie Dilag, Marketing and Sales Head of Tree Top Adventure in Subic. Jackie’s presentation was about branding, both for businesses and individuals. Jackie spoke of brands that have dominated their respective brand categories, and also shared some tools and tips on how to estabish one’s brand. The last speaker for the event was the VoiceMaster, who discussed the art of public speaking. Pocholo started his presentation with an introduction of who he is and what he does, and how he journeyed into the public speaking arena. He also gave the audience a glimpse of his career as a voice artist, and impressed the audience with his reportoire of character voices. Pocholo then transitioned to his topic, and gave an explanation as to why public speaking has become the number 1 fear in the world. He also talked about spontaneity, and how this quality can be the key to overcoming a person’s fear of public speaking. Pocholo also reminded the participants to always speak FOR the audience instead of TO the audience. He also emphasized the use of humor, stories and pauses to make one’s presentation powerful, engaging and memorable. The workshop was organized TAG Media and Public Relations in partnership with Elabram Systems, Multibiz International Corp., Tree Top Adventure and Zoomanity Group.